My first project was this Harlequin Runner, showcasing my Bella collection for Blend Fabrics. It is based off of my quilt pattern by the same name. You can see a video about how I made it here. 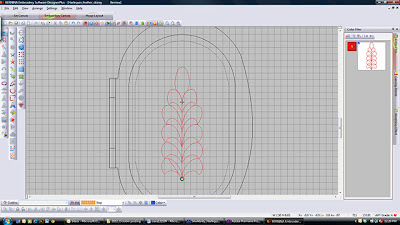 I embellished the flower with wool flowers that I made using the CutWork tool because... Bernina also invited me to try their new DesignWorks software! 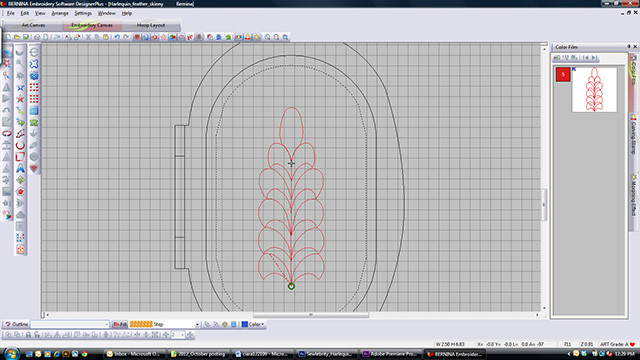 With DesignWorks, you can design CutWork shapes and PaintWork and CrystalWork to port over to the 780. Best of all, DesignWorks is REALLY easy to use! 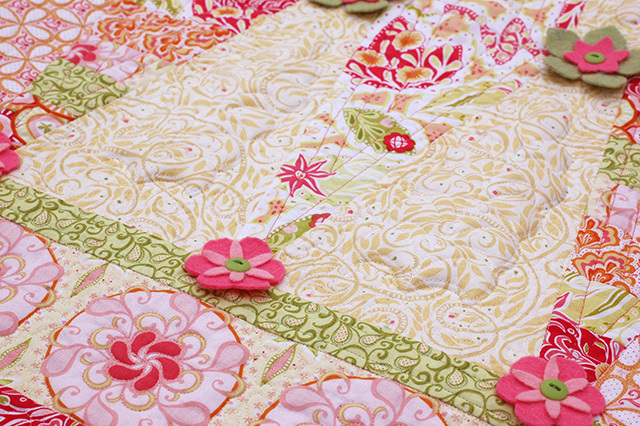 I also incorporated some custom trapunto feathers into the quilting! The secret to giving the impression that one's quilting skills are better than they are is to design the feather in Bernina's DesignerPlus software! The stippling and petal border that you can see in the upper left were done with the 780's Stitch Regulator. This is the first of 6 projects with which I experimented. I'll be posting a new one on Wednesday and Friday and more Monday, Wednesday, and Friday of next week. I want to thank Bernina for providing me with this opportunity and also Sew Much Fun, my local dealer for helping make it a reality. 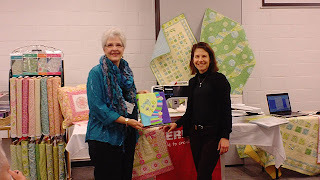 This is Drusilla Munnell, the owner of Sew Much Fun, and I at my presentation. Drusilla's beautiful and fun holiday display! They just moved into a beautiful new space, and it is huge! To see more about the process I used to make the runner, take a peek at the video I made. If you would like to enter to win a free Harlequin pattern and three Bella fat quarters, leave me one comment at the bottom of this post telling me something special you have made to give a loved one (or yourself) this year! I'd love for you to consider becoming a follower if you aren't already, but it isn't a requirement. You have until really late tomorrow (Tuesday the 18th) when I post the next project to enter. I made a Christmas quilt for my oldest sister this year, just sent it off last week. She was so surprised and just loved it. I am a follower by the way. I made a quilt for my son. I finished it today except for the label. 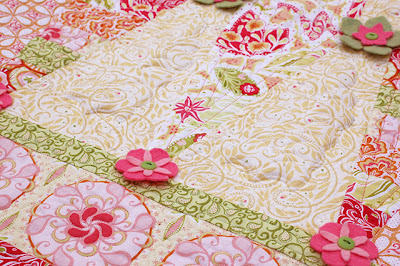 It also happens to be the very first quilt that I have actually finished since I have not been quilting all that long. Estou no final de uma colcha Flores da Vovó para minha neta. Será que vai ser presente deste natal?Já fiz para família toda esta é da caçula,oito meses.Obrigada. Your table runner is beautiful! 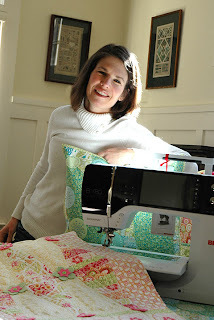 I'd love to have a bernina...maybe someday. This year I've enjoyed making little coin purses to give as gifts. I have been making lots of gifts for blog swaps and have loved making every one. I will probably never meet some of the people I swap with but they will always be my friend. I made a twin size quilt for my daughter. I'm happy to say that she loved it. I finished three large lap quilts to be given to foster children in our county. Nothing finished for the family, though. I've made a lot of gifts this year. Placemats, scarves, little bags. It has been fun choosing fabrics that I think the recipient would like. Thanks for the chance! I finished a Christmas themed quilt for my grandmother this year. Also, I made some laptop covers and origami material trivets for friends. I've been an avid follower of your blog! I made lots of gift items this year...most given to my grown children for their homes and some for friends along with a few for me. I'm a happy follower of your blog....thanks for the sweet giveaway! I am a follower via facebook. Very interested in your Bernina post as I am currently wanting a 710 but may re-look at the 780 now. My 37 yearold machine is beyond repair now so I canr do any machine work! So I made a hand sewn clamshell pieced Owl from Art GAllery Fabrics for my 2 yr old Grandson and it never leaves his bed. I love that he loves it so much! I just finished a New York themed quilt for my son who just moved to New York City. He was just complaining about how cold he is because he spent the previous 3 years in New Orleans. He's coming home for Christmas, the first time in 2 years, so the quilt is my special gift to him to take home with him when he leaves. I made a 'Groove' quilt for my son who went off to university in September! i didn't make anything out of fabric, but i did make some greeting cards with quilt patterns on them for a quilting friend. i'm a follower, too. I made a quilt for my Dad for Father's Day. It was an art deco style that matches my folks decor. He really liked it! Really nice to read about your impressions of the 780. It sounds like it has a ton of cool features. This year my most treasured projects were the 2 quilts I made using blocks that my readers sent in honor of my nephew that were raffled off at the annual softball tournament in his memory. All I make is for my loved ones. I made my daughter a wall hanging fir every month if the year. I gave been looking to buy this machine. Anything I should know would e appreciated. I have made wall hangings for two niece, one for my sister and an advent calender .I have been pretty busy. Beautiful runner and I enjoy your blog. My big handmade effort this season wasn't a Christmas present, but rather a wedding gify. I made my niece a quilt and also handcrafted 125 bird ornaments to serve as wedding favors for her guests. I am a happy follower of your blog. I am finishing up a large quilt for my baby-sister and her new hubby! I love that table-runner you made! I have given 2 large quilts for milestone birthdays, personalized quilted journals for encouragement, memory table runners for my sisters made from my dad's work shirts, appliqued scarves for neighborhood children, and today working on scrappy Christmas stockings for unsuspecting recipients. I made bed size quilts for each of my six grandchildren for Christmas this year. I'm a follower via email. 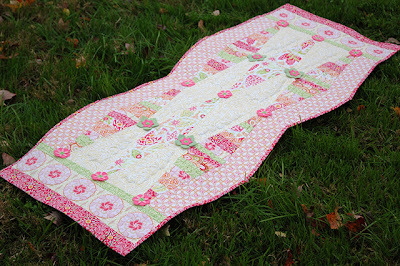 Amanda--the table runner is just beautiful -- love the design and the fabric. Thinking back on what I've made this year - many special things come to mind. A pieced a flannel quilt in memory of our two horses that we lost recently... and a special little throw for a benefit auction for a special little girl. Also made many gifts for my grandchildren. Sewing is my joy -- thanks for keeping us inspired with your beautiful patterns and fabric! 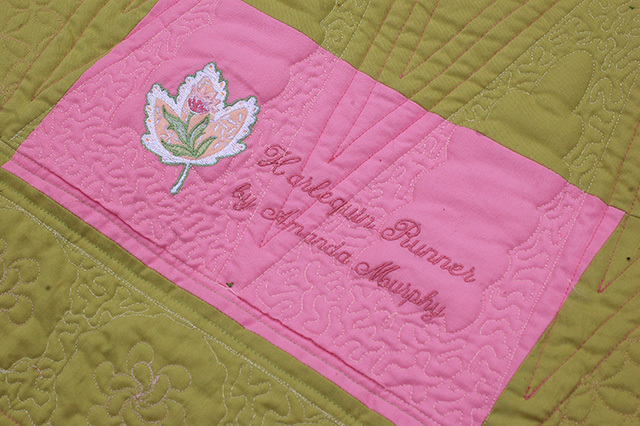 What a beautiful runner, gorgeous quilting too! I have made a Quilt of Valor for my son-in-law who is an Army Captain. He has done 2 tours, one to Iraq and one to Afghanistan, yet returned to a foreign base in Germany and has never received one. I am so excited to give it to him! They are arriving in Maine on the 22nd, and I hope I can keep the surprise until Christmas! I made several gifts this year - Tote bags, table runners, pillows, pajama pants, doll clothes, and girls clothing. Homemade gifts are the best! I always make quilts for high school graduations, and this was one of those years. I also had. Two daughters move to new apartments, and I made new quilts for them also. I made myself a blue and white queen-sized quilt with 4 matching pillows. I am so proud of myself that I actually completed this quilt and the pillows. It is quite pretty, if I do say so. Once again you have made a fabulous runner. I enjoy being a follower. You are very good to us and always take time out of your hectic life to share with us. Thank you for the chance to win the free Harlequin pattern and three fat quarters. Can't wait to start another quilt. I just finished pajamas and a sleeper for my two grand babies. Then I made a fleece texture blanket for the littlest one and now I am making pot holders for my daughters. I am making a king size quilt for my brother and his wife. It's huge. Hoping to get it done by Christmas. I am trying to get some dish towels and shirts embroidered for my sisters but quickly running out of time. Just starting my quilting so haven't made a quilt project for anyone yet. Knitting is where I have made gifts this year, a pair of socks for my husband, a scarf for my step mother and a shawl for a friend. 2013 will be the year of quilts for me. Scarves, hats and lap quilts. Next year will start earlier! I say that every year. I am quilting a quilt I made for a friend I met almost 40 years ago in England. The quilt has British logos and scenes on the fabrics. We were both there with our husbands, who were in the USAF. I've made several gifts this year, but my most precious has to be the quilts I made for my grandaughter and her new baby brother. They are coordinating and I used little birds to personalize them as there parents had a pair of "Love Birds" on top of their wedding cake. Thanks for the giveaway, always love working with your fabric. 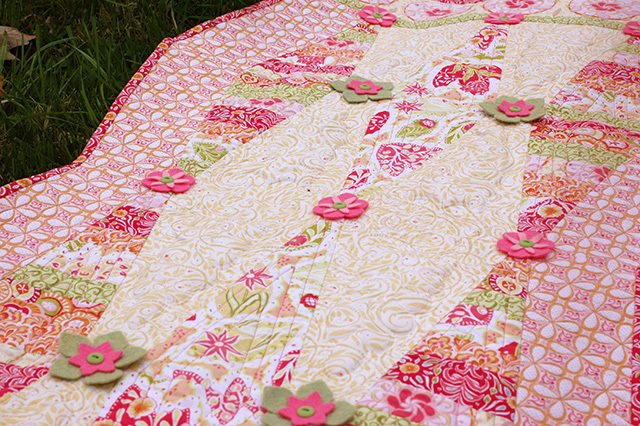 Oh I've made quilts galore for all my nieces and nephews!!!!!! And a special one for the first great niece as this is her first Christmas! I just finished a wedding quilt for our daughter & new son-in-law. They were married this October but with all the wedding preparations, I had only completed the top! It's now quilted and I finished the binding last week! It's going under the Christmas tree, a little late but worth waiting for!! I'm a follower. Thanks for the chance to win & Happy Holidays!! I love that table runner, the little wool flowers really add a touch of whimsy. I moved earlier this year and don't have my sewing space ready, which is really stressing me. So I have been knitting lots of Christmas gifts, mittens, little sweater ornaments to use to put $$$ in -- folded to look like a little shirt under the sweater. A hat and a couple shawls. Can't wait to pet all my fabrics again!!! Beautiful runner, the flowers are just the right touch. Oh, how I'd love to have one of those machines! I went to watch your video, too! I've been making coin purses for some of my gifting this year! Your runner is lovely and so well quilted ! I have made several table toppers for gifts this year and enjoyed it so much. Thanks for the chance . I made a lot of quilts as gifts this year...my daughter for graduation, my friends son because I saw Thomas the Tank Engine fabric I had to use...many more. I love your fabrics!! I made a Thanksgiving quilt for my brother [his request] and a cat quilt[Neko*] for my best friend. I made a new flannel bed quilt for myself. And a bed quilt for my nurse's toddler! I didn't make any quilts for Christmas gifts this year. I did give my oldest son a quilt a few months ago and will give the other two quilts in the following months. I designed a set of plates and mugs for one son, so I spent a lot of creative energy doing that! I love the quilting you've done on your runner. It's just beautiful! I made two quilts this year. One for my sister in-law I used Daisy Cottage jelly roll(I just love that fabric) and one for her husband it was for thier 25th wedding anniversary. I live in Michigan and he is a big Detroit Lions fan and I found some Detroit Lions fabric on line. Let me tell you I was his favorite person at least the day I gave him his quilt he LOVED it!! I just finished making special pillow cases for my brother-in-law and his wife. They came up to help my husband and I take care of their mother who died last week. I am in the process of making quilts for everyone in my family, I finished my grandsons and the look on their faces and how fast they grabbed then and hugged and snuggled in them was priceless. I made a crazy quilt wall hanging for my mom this year. I am already a follower of your lovely blog. I don't always comment but do read every post. So much inspiration here. I was so excited to see what you have done with the 780. I just purchased one today. Can't wait to get it. I made a Memories tree cushion by Dont Look Now for my friend's birthday - I loved it so much I made another for a friend, but now I need to make one for myself! Beautiful table runner! I finally got around to making my Daughter a pillowcase to match the quilt I made her a couple years ago. The hard part (quilt) was made quickly but the simplest thing (pillowcase) took forever lol. I made a rag quilt for my Mother-in-law this year. A beautiful design. 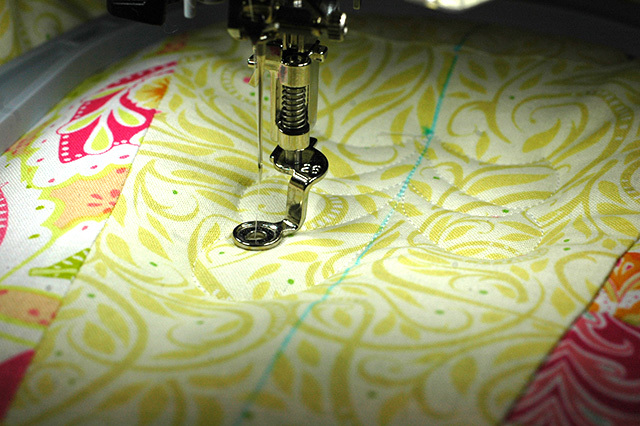 I like my old Bernina 1160, but would love to be able to experiment with all those lovely new features! Made 2 quilts for family members who are battling Cancer. I just completed a baby quilt for my god child's first baby. It was a lot of fun and I hope they enjoy it. Thanks for the having the giveaway and the chance to win! Well I have just about got the quilt done for my son It's a little late as he told me to work on the McCall's project first, But I only have the borders of his king size quilt to do and I will quilt it after Christmas. thanks for hosting a great give away. This year I surprised a coworker with a baby quilt for her first grandchild. She was moving away to be closer to him and had chosen the name "TeaMa" as her grandma name. 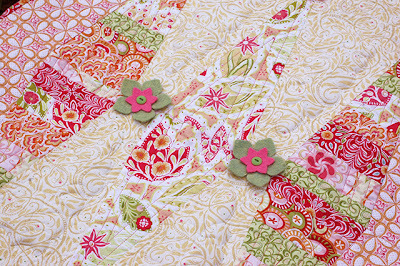 The quilt backing had some teacups from the Metro Cafe line...it was cute and she loved it! I am already a follower, thanks! I made a dalmation dog costume for my little girl. She wore it constantly for days and days. I'll be making a cat costume next! This year I made a raggy flannel quilt for me, and it is really girly, so far from everything I usually make. I made a baby quilt for my neighbour's granddaughter, Heidi, who is 7 months old now. I have a bucket list to finish something quilted for 12 grandchildren and leave things for future great-grand children. Two table runners have been gifted this year and three more should be finished by Christmas I must have a baby quilt and a bridal shower gift by May. Thank goodness for my Bernina embroidery machine. P.S. I just learned to quilt at 75 years of age. My very dear sister-in-law started a quilt for her grandson last year with my help but just couldn't finish it with her busy life. I brought it home with me & I am finishing it for her. I made a quilt with big eyed embroidered animals for my nieces second birthday. I'm working on two matching quilts for my mom and her sister. They won't be exactly the same, but similiar. Thanks for the chance to win! I'm making table runners, tea towels, and potholders for gifts. Shhhhh, it's a secret. I spent the entire year making -- and finally FINISHING! -- a Drunkard's Path quilt for my son's bed that I had started in October 2011. Slow and steady eventually does win the race! I have already selected fabrics for a Storm at Sea quilt that I'm planning for a girlfriend who went through a divorce this year. She posted a fortune cookie message on Facebook that said "You can't stop the waves but you can learn to surf" and I immediately thought of Storm at Sea for her. Hey -- I've used professionally digitized outline quilting designs on my quilts, but I've never digitized my own design even though I do have the Designer Plus software. 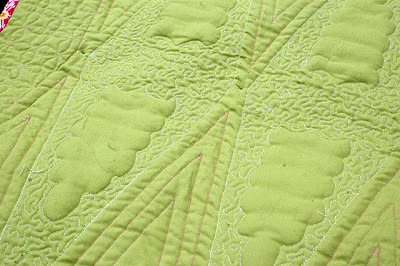 Have you written already, or would you consider writing, a post where you go into more detail about how you digitize your quilting feathers? Are you manually digitizing, scanning in a line drawing and autodigitizing, or some other way? 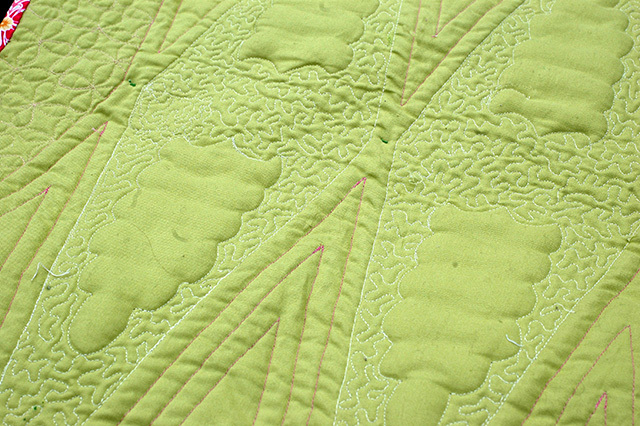 Any special considerations when digitizing a quilting design, like settings, where to position the beginning stitch, etc? Now I'm going to watch your Harlequin Runner video. I LOVE the cute little flowers -- those would be perfect on a little girl's hair barrettes, too! 263on baby quilts for two friends due in January. Have QE440, maybe some day I can add a 780. Love your fabric line! Made 3 Big Quilts for the Grandtreasures..as I was moving away and they had outgrown their baby quilts. Wanted them to have something to snuggle while missing Gramma no longer living 7 mins. away. Merry Christmas and thanks for the chance to win your giveaway! Fun runner and projects. I'm still working with my granddaughter on some aprons. I think we'll get them done but we have until the 27th so we have a bit of extra breathing room. Thanks.